So what is a Guitar? We're guessing that you already know it's somesort of musical instrument, but if you're not familiar with the specifics then let us make it clear for you! 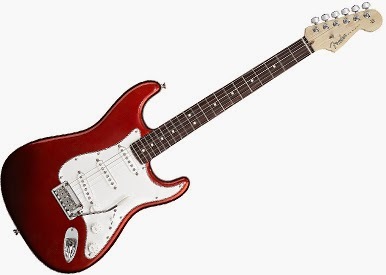 A guitar, or electric guitar typically has 6 strings and takes form in the shape of the guitars pictured although they do come in various shapes, with more or even less strings but for the purpose of this page we'll be explaining about a 'typical' guitar which in it's own right is the most popular of all. In it's simplist explanation, the guitar is played by strumming or picking the strings, which sends vibrations picked up by the 'pick-ups' that send sound through the instrument cable to the amplifier ready for cranking up to 11! See the below diagram for a detailed look at the components that make up a guitar. What Are the Different Types of Guitars? Guitars fall into two broad groups: acoustic and electric. 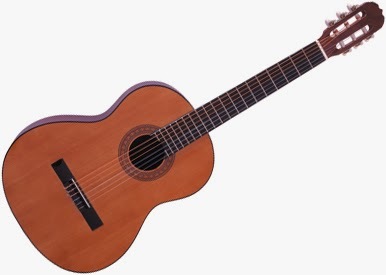 Within the acoustic category are classical, flamenco and steel-string instruments. The electric types include leads and basses. Some models are a hybrid of acoustics and electrics, having the sound and basic design of the first group but being outfitted with parts that amplify the sound when desired. Certain kinds work better for particular genres of music than others, so many players choose instruments based on the style they want to play or effects they want to get. Acoustic guitars rely on a soundboard to convert and amplify the energy of vibrating strings. Originating from instruments in Asia, they have been around in various designs for hundreds of years and don't require any electricity to get a good sound. They usually have a hollow body and are made of various types of wood. Unlike acoustics, electrics require an amplifier to produce a good sound. Companies first started making them in the 1930s when genres like jazz and swing were very popular. Originally, they had semi-hollow bodies for a well-rounded, warmer tone, but eventually, guitar makers figured out that solid construction typically worked better overall for the types of music people wanted them for.